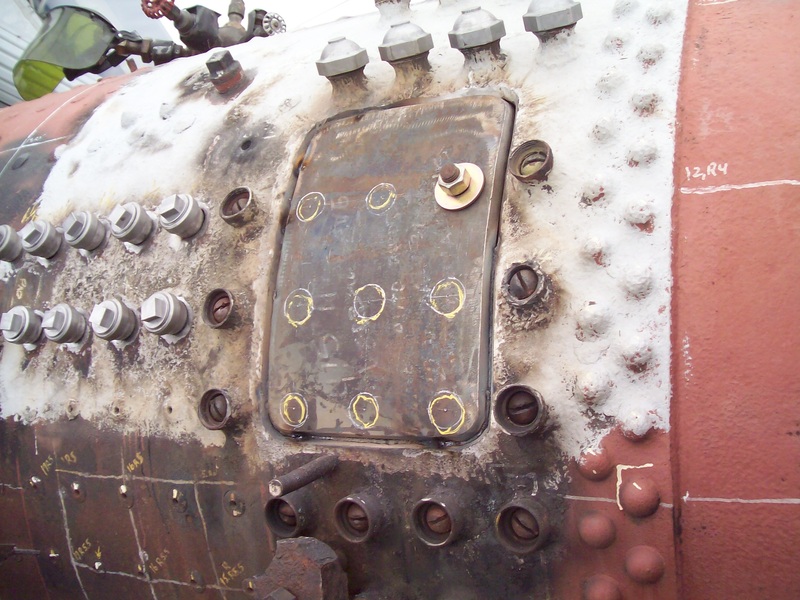 Here’s the work we have been waiting for, the boiler patch. To facilitate the work, the crew decided to spend a week out here; prepping, patching, cleaning. 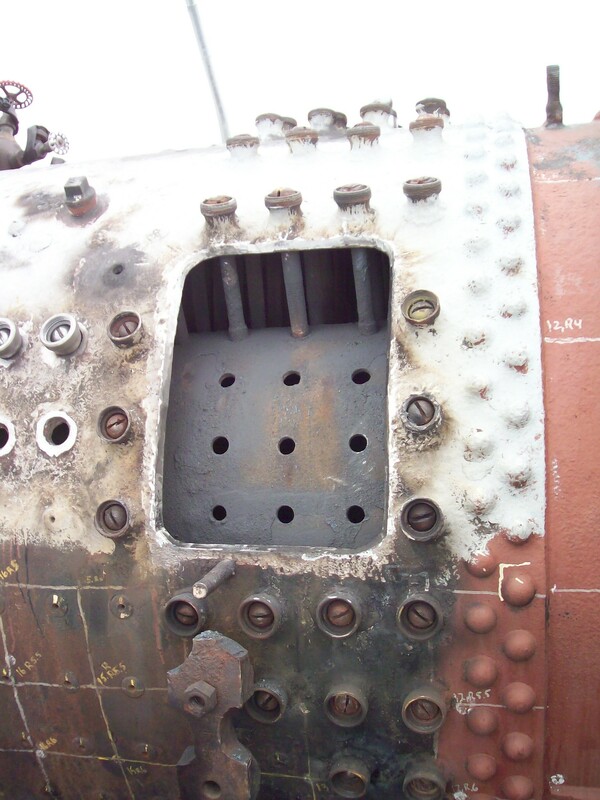 They hoped to place the patch and finish the staybolt installation and, if time allowed, continue dismantling and prepping for the next big event; lifting the frame and boiler off the drivers. The patch was priority #1! Robbie Jett of Olancha, a seasoned welder with all the right credentials, offered his services at a very reasonable rate. He brought his camper up for the week and welding truck and off he went. First cutting out the old material. Then fitting the new metal. Robbie put some small tabs inside for the metal to rest against and then we cut a hole where a staybolt would go and pulled the piece tight. He was ready for the all important “root pass” this is done with 6010 welding rod. Once the piece had a full penetration root pass he ran a second “hot pass” with 7018 rod. Now we were ready to install the bolts and sleeves. 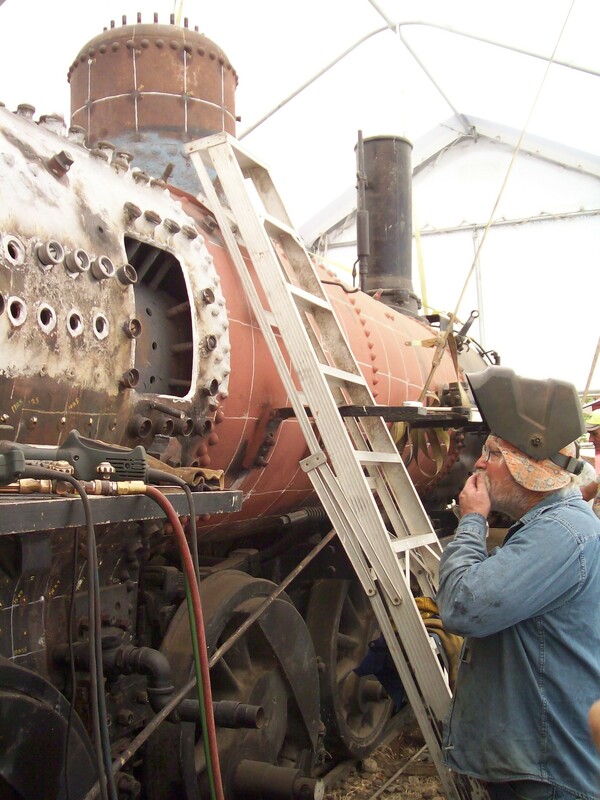 While Randy was working on that, Robbie went to the other side of the boiler and started welding in the sleeves that were all ready to go. 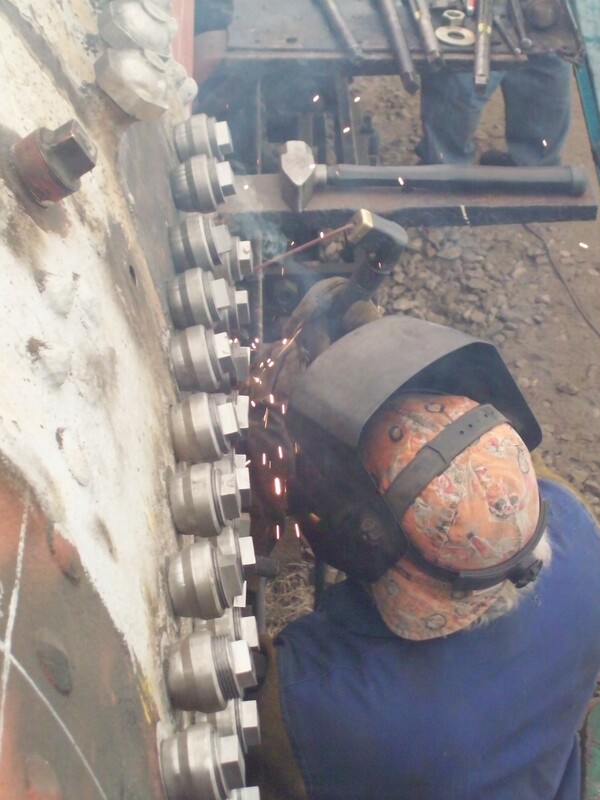 Then finally it was back to the patch for the final welding passes and also to weld the remaining sleeves in place. In all it took only 4 days to do a boiler flush patch and 56 staybolts! 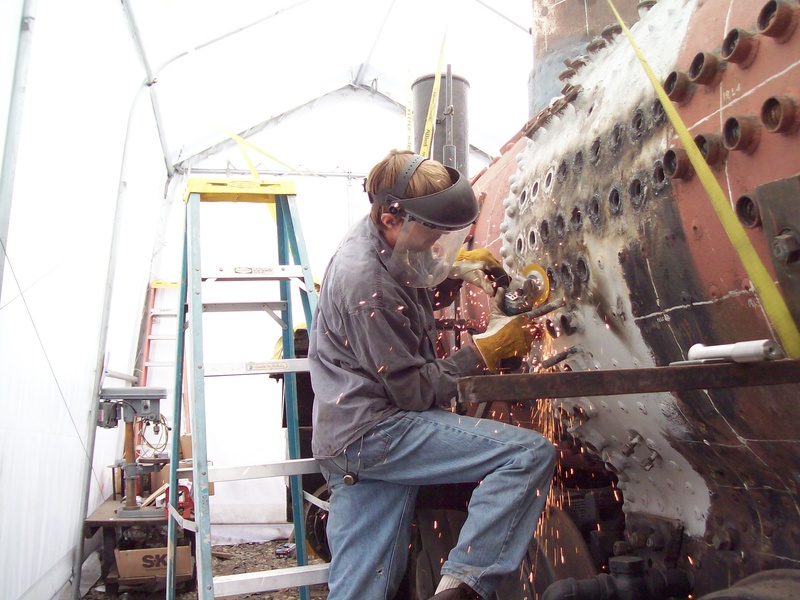 (above)Our great welder, Robbie Jett, welds the final pass. 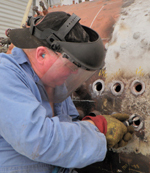 (right)Marty Westland prepares the shell to receive new staybolts. Robbie must weld every one of them in place. Boiler work is heavily regulated. Before it is approved for use ours will be filled with water and hydro tested. 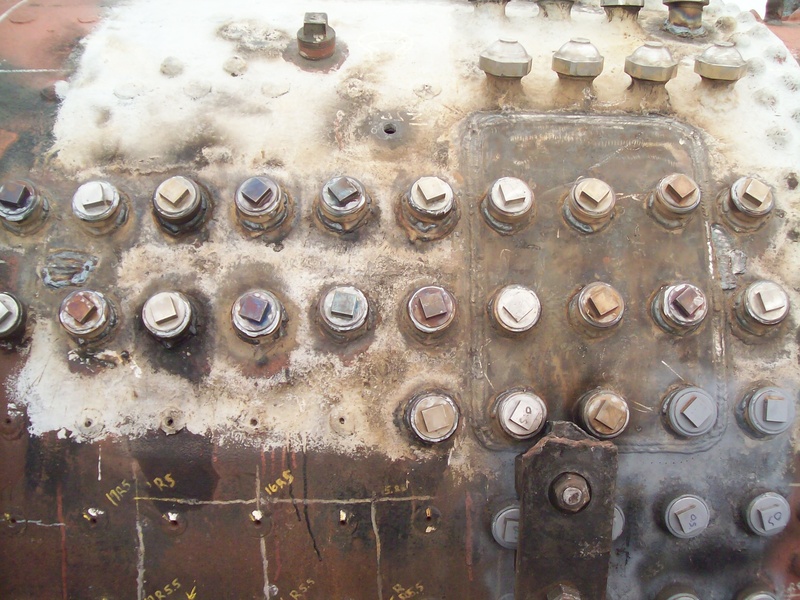 (below)Staybolts welded in place as seen from the outside and inside the firebox. 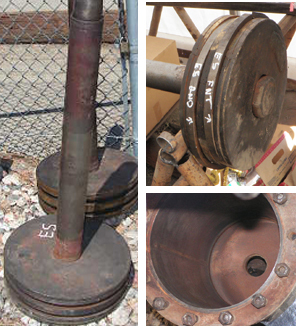 The cylinders were lightly scored, nothing we can’t handle. 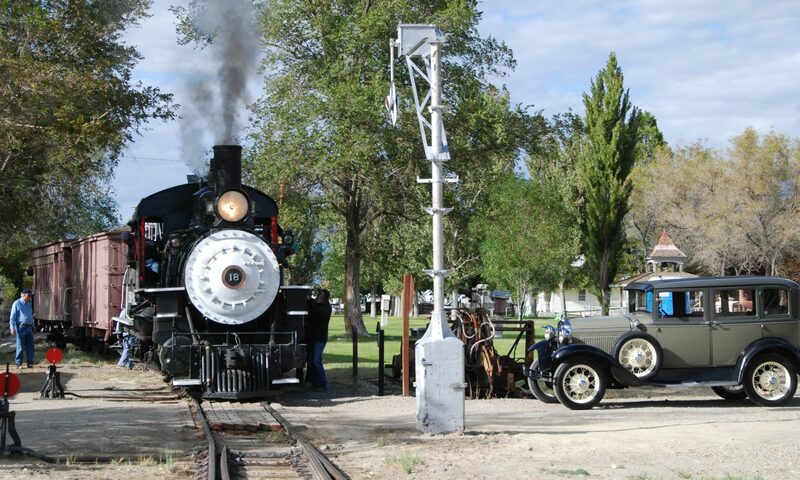 Looking at the pistons and rings you can see where the early makers of internal combustion engines got their ideas. Travis worked on installing the Johnson bar and distributing valve reservoir onto the newly installed engineers side cab floor.